Last Sunday, the Euro 2012 football tournament had a thrilling climax with a 4-0 win for Spain over Italy. The event was momentous because in doing so Spain broke a number of records -first team to defend the title, highest winning margin in a final, first team to win three major tournaments in a row… This was a big event with Twitter reporting that when the fourth Spanish goal went in there were more than 15,000 tweets per second beating the previous record for a sporting event of just over 12,000 for the last three minutes of February’s Superbowl. There were 16.5 million tweets worldwide during the Spain vs Italy match. What this means is that this is a hotspot for anyone looking to promote or gain followers. If you have anything to say about football or to the following demographic you need to be there. After my earlier post about the Formula 1 social media activity I thought I would check on what the some of the Euro 2012 global sponsors did with the event. They made a magnificent effort. 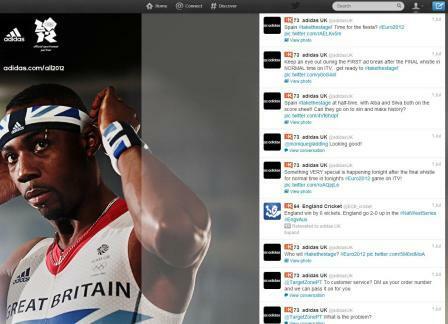 Their @adidasUK site was tweeting throughout the final. They linked their new #takethestage Olympic ad by trailing its launch after the final whistle. They also ran a promotion based on offering a discount on the online store according to the number of goals scored. Overall the site retweets relevant sporting comment and is highly interactive. They are a really good example of a joined up strategy. A mixed bag for @ContiUK. The team did a good job with regular tweeting about the event and competitions running alongside it – guessing the scores and spot the ball. Strangely silent on Sunday though which was a missed opportunity for them. This isn’t all the global sponsors by any means – merely the first five alphabetically. You could also argue that of the ones listed Adidas is the most directly associated with the sport. However, my response would be that Social Media offers an excellent way for any brand to have their say – anyone can tweet during the final and use the hashtags. The work of @AdidasUK is obvious from their Klout scores over the period. They raised their overall Klout score from 71.66 at the start of the tournament to 73.44 at the end. The main driver for this was their Klout True Reach – this measure takes out all the spam and bots and looks at the real people who act on AdidasUK content. This went up from 69,995 to an astonishing 93,239. Another interesting characteristic is that there is a clear build up to England’s game with Italy on 24th June. All stats dropped off immediately after the game but the team at @AdidasUK did a really good job of building them back up again and they have a legacy from the event to work with. We have the 2012 Olympics coming and Twitter are expecting many records to be broken during them (social media as well as athletic). Coca Cola are already on the ball with this but how are Acer, ATOS, GE, Visa and P&G coping?